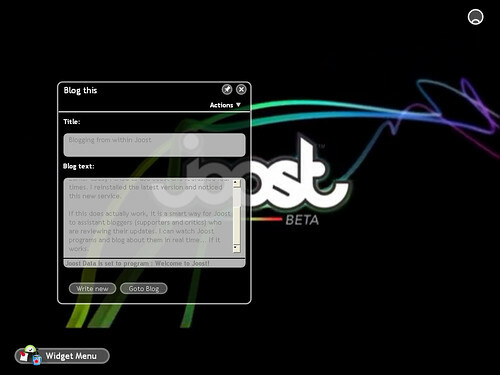 This entry is a test to see if the blogging tool within Joost is functional. Earlier today I tried to use Joost and it crashed four times. I reinstalled the latest version and noticed this new service. If this does actually work, it is a smart way for Joost to assist bloggers (supporters and critics) who are reviewing their updates. I can watch Joost programs and blog about them in real time… If it works. So, it worked. The first changes I feel Joost should make to their blogging module is to provide the option to add tags, because the default is “uncategorized”. I see this blogging option being beneficial to more than just Joost… Besides making it easier for Joost to get free promo through bloggers, anyone who wishes to review, document, or expand on any content within Joost now has the option to do so in real time. If Joost ever gets into the live streaming business, anyone in the world could liveblog a conference regardless of whether they were actually there in person – as long as they could watch and blog within Joost. A quick ‘Blog about this show’ and a ‘Read blogs about this show’ button would be pretty neat. So people can easily write about shows. We hope you’re enjoying your Joost experience. We’d like to share some good news and celebrate the launch of the new Joost beta – Now For Friends. This means you can now invite as many friends as you want to try out Joost. To access your invites, log onto Joost, go to My Joost and fill in your friends’ details in the Invite Friends widget box. If you’re running out of friends, you can make new ones by letting people know you’ve got invites. To help with this, we’ve made a few goodies especially for you, which you can find at http://www.joost.com/share/goodies.html. Last but not least, we invite you to enjoy the variety of new shows we’re introducing each week. This week will bring you a host of over 40 new channels in the US including Adult Swim, five new channels from National Geographic, new channels like Spike TV from Viacom, great comedy from Heavy, and classic series from Hasbro such as The Transformers. And that’s just the beginning. If you’ve got any questions, feel free to check out our forum http://www.joost.com/forums, and don’t forget to send us feedback on what you like and things we could improve. Enjoy, and see you on Joost! I am awful, I know. I promised Joost invites and then life took over and I never replied back to the 5-10 or so that asked for some. Now I have no excuse, so, hit me up with First/Last name to use and email and I will send you one by the end of this weekend. WARNING: If requests exceed…. 20, I reserve the right to send the rest later next week.